Are you ready to make a donation to advance higher learning at UNA? Gifts of $100 or more earn you an engraved brick in the Alumni Victory Garden. See the great things our alumni are doing! The 1830 Fund echoes the mission of UNA by providing important support for academic & student program initiatives. Supporters at any level can make a difference in the lives of our students. The UNA Communications program values hands-on learning as well as theoretical learning, all grounded in ethical decision-making to reflect the importance of the free flow of information in a society. Meet our University Advancement, Alumni Relations, and Communications & Marketing Staff. Thank you for visiting the Office of University Advancement website. Here you will find additional links to Alumni Relations, all the Advancement Offices, explore numerous ways to support the University through financial giving and the office of university communications. It is our goal to provide the most current events and activities for you to participate, as well as the recent news and publications to help you stay connected at UNA. In addition, we want you to be aware of how you can make a significant impact on the life of the University, our faculty and students through giving opportunities. I hope you will take time to meet our staff and explore the various advancement programs at UNA. Please let us know if we can assist you in supporting UNA. 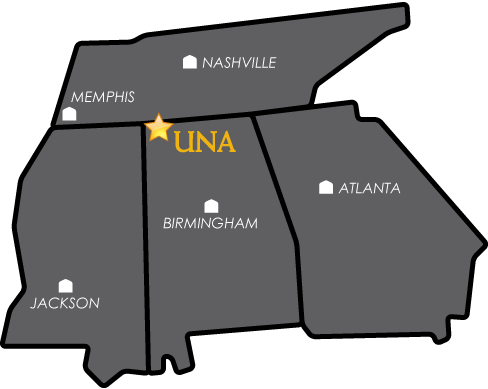 It’s an exciting time for UNA! And this UNA graduate could not be happier to be a part of it. Our campus is more beautiful than ever, student enrollment is at a record high, and academic programs are being recognized nationally for their prominence. Our sports programs have been ranked nationally, and we have distinguished alumni all over the globe. I’ve always known UNA was special, and having the opportunity to give back to the school which gave so much to me is a dream come true. Many of the best memories of my life happened right on this campus, and I am sure many of you feel the same way. The Office of Advancement includes alumni relations, development and university communications and marketing. I am fortunate to work with a staff of outstanding individuals who love this place as much as I do, and their energy and enthusiasm for UNA and the Shoals area is contagious. They share my commitment to serve our university in a way that makes everyone proud. My goal is to reach out to our alumni and friends, and ask that you increase your engagement with UNA, or perhaps connect for the first time. There has been no better time to get involved. We need your help, and with it we will take UNA to new heights of greatness. Let’s work together to build a better tomorrow, by helping the students of today. Deborah L. Shaw ’82, Ed.D. Time to renew your Alabama car tag? Consider getting the UNA vanity plate and donate money for student scholarships at the same time! For each UNA car tag purchased, $47.50 goes to student scholarships!